UPDATE: March 16, 2017 – An illustrated answer key for the 2017 NASA Pi Day Challenge is now available here. Were you able to solve these stellar mysteries using pi? 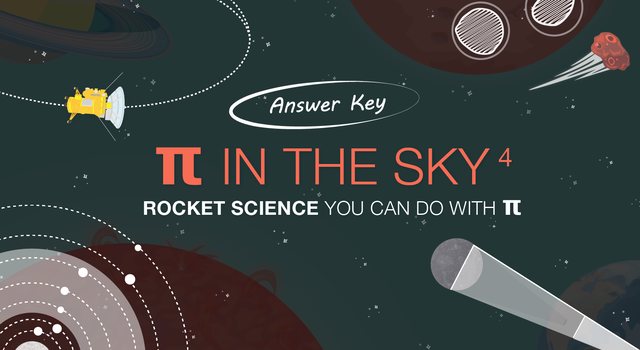 Check your answers on our illustrated answer key and download the free "Pi in the Sky4" poster set. NASA is giving space fans a reason to celebrate Pi Day, the March 14 holiday created in honor of the mathematical constant pi. For the fourth year in a row, the agency’s Jet Propulsion Laboratory has created an illustrated Pi Day Challenge featuring four math problems NASA scientists and engineers must solve to explore space. The challenge is designed to get students excited about pi and its applications beyond the classroom. This year’s problem set, designed for students in grade six through high school – but fun for all – features Mars craters, a total solar eclipse, a close encounter with Saturn, and the search for habitable worlds. 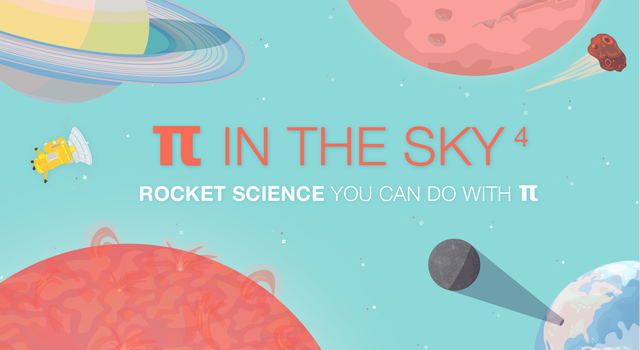 › Take the NASA Pi Day Challenge! › Educators, get the standards-aligned Pi Day Challenge lesson and download the free poster and handouts. The answers to all four problems will be released in a companion infographic on March 16. Read on for more about Pi Day, the science behind the 2017 problem set and to learn how NASA scientists and engineers use pi. Solve a Martian crater mystery, measure the size of the moon’s shadow during a total solar eclipse, get into a daring orbit around Saturn, and discover potentially habitable worlds beyond our solar system. 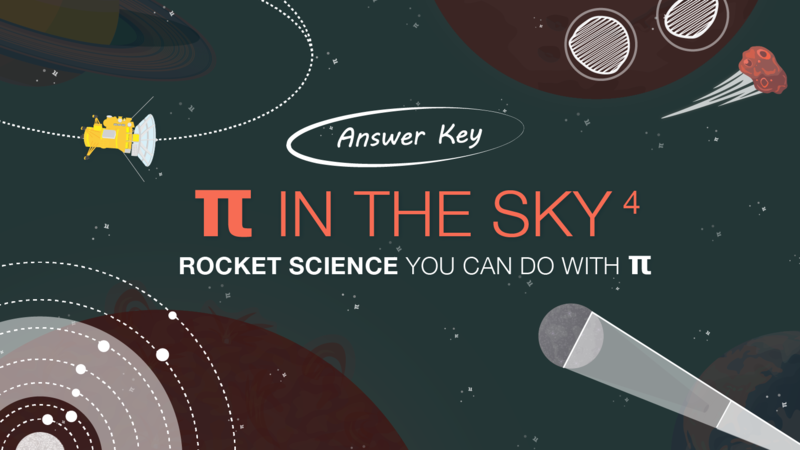 You don’t have to be a NASA rocket scientist to do stellar math with pi. Pi is what’s known as an irrational number, meaning its decimal representation never ends and it never repeats. It has been calculated to more than one trillion digits, but NASA scientists and engineers actually use far fewer digits in their calculations (see “How Many Decimals of Pi Do We Really Need?”). The approximation 3.14 is often precise enough, hence the celebration occurring on March 14, or 3/14 (when written in US month/day format). The first known celebration occurred in 1988, and in 2009, the US House of Representatives passed a resolution designating March 14 as Pi Day and encouraging teachers and students to celebrate the day with activities that teach students about pi. While many of us celebrate by eating pi-themed pie and trying to memorize as many digits of pi as possible (the record is 70,030 digits), scientists and engineers at NASA take pi even further, using it in their day-to-day work exploring space! Rachel Weinberg works on the Orbiting Carbon Observatory 3, or OCO-3, instrument, which will track the distribution of carbon dioxide across Earth. She says pi came in handy during her studies at MIT and still does today for her work at JPL. “Just the other day during a meeting, the team went to the whiteboard and used pi to discuss the angles and dimensions of optical components on OCO-3,” she said. 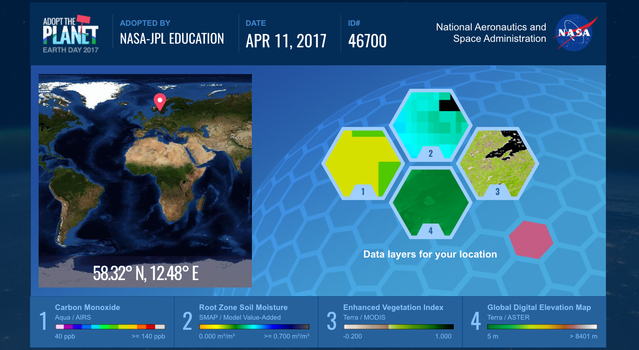 The Pi Day Challenge gives students a chance to take part in recent discoveries and upcoming celestial events, all while using math and pi just like NASA scientists and engineers. NASA's Pi Day Challenge in the Classroom! 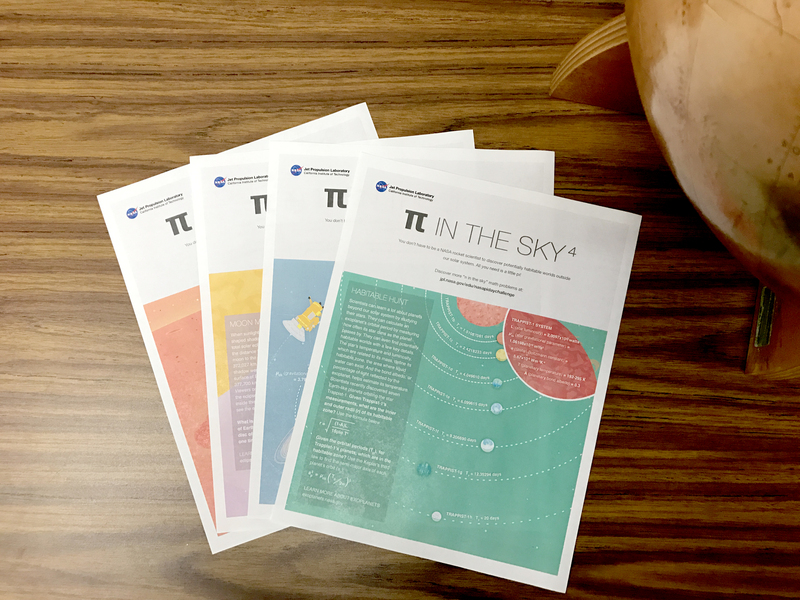 The NASA Pi Day Challenge is available as a standards-aligned lesson for grades 6-12. In the illustrated math problem set, students use pi to solve real-world science and engineering problems related to craters on Mars, a total solar eclipse, a daring orbit about Saturn, and the search for habitable worlds. Here’s some of the science behind this year’s problem set. The craters that cover Mars can tell us a lot about the Red Planet. Studying ejecta – the material blasted out during an impact – can tell us even more. Information about ejecta patterns even came up during a recent workshop to discuss and select the final candidates for the Mars 2020 rover landing site. For the first problem in our Pi Day Challenge, students use pi and the area and perimeter of two craters to identify which was made by an impactor that struck Mars at a low angle. Researchers found that low-angle impactors create an unusual ejecta pattern around craters on Mars. As part of the research, scientists are currently working to identify and catalog these craters. The year 2017 brings a unique astronomical event to the United States for the first time in nearly 40 years! On August 21, 2017, a total solar eclipse will cross the continental United States. Starting in Oregon, the shadow of the moon will cross the country at more than 1,000 miles per hour, making its way to the Atlantic Ocean off the coast of South Carolina. Everyone inside the moon’s shadow will witness one of the most impressive sights nature has to offer. So how big is the shadow? In the second part of NASA’s Pi Day Challenge, students will use pi to calculate the area of the moon’s shadow on Earth during the total solar eclipse. This year also marks the final chapter in the exciting story of NASA’s Cassini mission at Saturn. 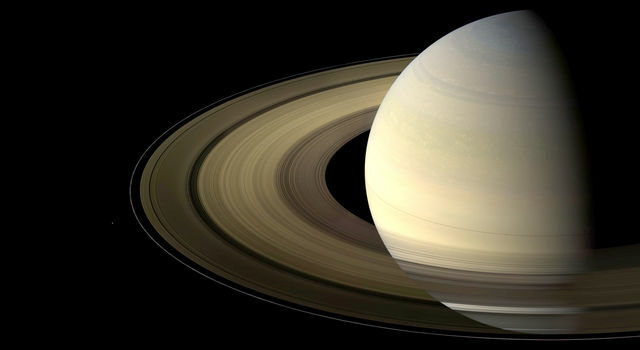 Since 2004, Cassini has been orbiting the ringed giant, vastly improving our understanding of the second largest planet in the solar system. After more than 12 years around Saturn, Cassini’s fuel is running low, so mission operators have devised a grand finale that will take the spacecraft closer to Saturn than ever before – inside the gap between the planet and its rings – and finally into Saturn’s cloud tops, where it will burn up. The finale is designed to prevent the spacecraft from crashing into and possibly contaminating any of Saturn’s scientifically intriguing moons. In the Pi Day Challenge, students will use pi to safely navigate the spacecraft on its final orbits and dive into Saturn. Finally, students will investigate a relatively new and very exciting realm in astronomy, the search for habitable worlds. The discovery of exoplanets – worlds orbiting stars outside of our solar system – has changed our understanding of the universe. Until 1995, exoplanets hadn’t even been detected. Now, using the transit method – where planets are detected by measuring the light they block as they pass in front of a star – more than 2,300 exoplanets have been discovered. Recently, astronomers discovered a record seven Earth-size planets orbiting a single star called Trappist-1. Students will use pi to identify which of Trappist-1’s planets orbit in the star’s habitable zone – the area where liquid water could exist.